I got this from one of the kids in my third grade classroom, and I just had to laugh. I called him over and showed him the card. "You can't say this!" I insisted. He shook his head and did not recant. Other kids and parents took a look, rolled their eyes, and shook their smiling heads. 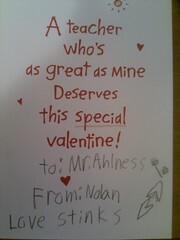 One more time I count myself lucky to be a teacher.